Brendan Colbert is a well-established Melbourne-based composer, but perhaps less widely known outside of his home city. While his music has been performed in other parts of Australia and overseas, this CD offers a welcome opportunity for listeners everywhere to enjoy a substantial body of the composer’s recent works. 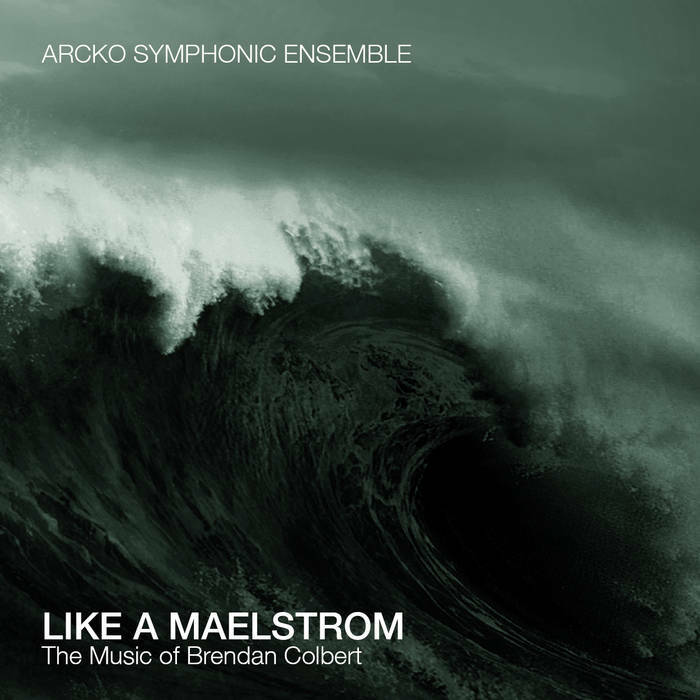 The CD is a recording of a live concert featuring Colbert’s music (in February 2015), presented by the ever-courageous Arcko Symphonic Ensemble, directed by Timothy Phillips. Proxima (2001, rev. 2011) is a strong, two movement work for string quartet, performed here by Silo String Quartet (which shares several members with Arcko). The first movement holds tightly to a structural and textural concept in which long contrapuntal lines are set against quietly bristling col legno battuto gestures. The second movement bustles through great swathes of notes, out of which many moments of interest flare and dissipate (such as a striking extended passage in which all four instruments play in extremely high register, one of several manifestations of the idea of ‘proximate’ closeness in the work). In the middle of the movement, the obsessive busyness is briefly and magically projected into a larger space through the interjection of slow bellbird-like flageolet harmonics. At the end, the energy of the work metamorphoses into lyricism; as the massed-quartet texture unravels, space opens up once again—this time for a beautiful line of slow moving notes on the cello. 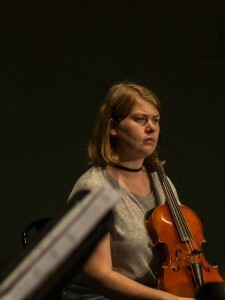 Torque (2013), for solo viola, is a five minute piece that starts out virtuosically and winds itself up from there in this thrilling performance by Phoebe Green. There is no respite, as the piece races inexorably towards a splendidly abrupt ending—and yet there is more to the work than just virtuosity and rising tension. Behind this surface, the close listener will discern the composer’s careful control of the unfolding material, and a sense of timing that is finely judged. …Floating in the Void… (1995, rev. 2005) is a very beautiful piece for 13 strings. Compared with the other music on the CD, this piece has slightly softer edges, and a more sustained poetic quality, while still manifesting the high-energy focus that is a hallmark of Colbert’s music. The composer seems to revel in the relative luxury and homogeneity of the larger string ensemble, and the imaginative subtleties of texture and sonority make for compelling listening. 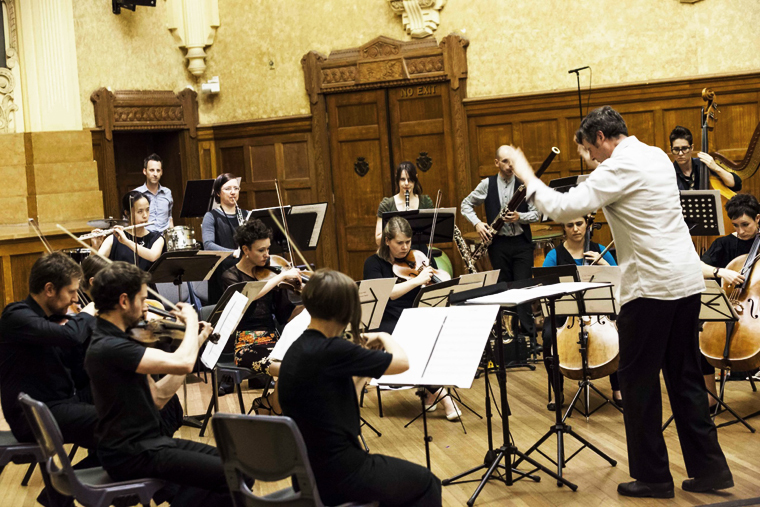 Arcko Symphonic Ensemble has championed this work strongly and deservedly—playing it five times since 2009—and it is a piece that is now somewhat overdue for wider recognition as among the finest string orchestra works by any Australian composer. Like A Maelstrom (2014) is, as the title suggests, a wild ride. Recorded here in its premiere performance, the work is a 30 minute concerto for piano, trumpet, percussion and strings. The obsessive quality that underpins much of Colbert’s work here tends toward a fixation with the fast and the loud, together with a massive density. As the piece builds toward each of its several climaxes, these are experienced by the listener as either lumberingly elephantine (in an effect similar to that of some electronic dance music, where the combination of fast surface tempo and glacially slow harmonic rhythm creates a kind of hyperactive zombie effect), or verging on the exhilarating lunacy of black midi (and indeed much of the instrument writing has a full-volume on/off quality that emphasises this pseudo-midi orchestration). Yet the moments where the textures suddenly thin out (opening up the vertical space vertiginously) or where the effective tempo temporarily slows (allowing space for individual sounds to reach the ear) are imbued with a dramatic power that is directly related to the mass and energy of the more maniacal passages… and the eye of a great storm does seem a suitable metaphor for this effect. The challenging solo parts are realised with fearless authority and flair by Bruno Siketa (trumpet) and Peter Dumsday (piano). This CD is a valuable document of an important concert performance. More broadly, it allows many listeners to develop (perhaps for the first time) an appreciation for Colbert’s music through the powerful body of work presented in these excellent performances.